With AWS, we ensure high-quality, consistent access of our mobile applications to customers, with availability levels at 99.999%. Founded in 2009, Kdan Mobile provides mobile applications and online services for digital content creation. Its flagship applications include Animation Desk Cloud, NoteLedge Cloud, PDF Markup Cloud, Pocket Scanner Cloud, and Write-on Video Cloud. These applications enable users to create and share projects and content across Android, Apple, and Windows devices. The business has offices in Taiwan, China, and the United States. Kdan Mobile started by delivering its mobile applications using an on-premises data center. However, the organization needed its customers to be able to access applications and content from any device, at any time, across a range of markets. The company’s existing infrastructure had reached capacity supporting 1.5 to two million users, and the Kdan Mobile technology team was not convinced it could support forecasted growth of up to 10 million users without considerable upfront capital investment. Kdan Mobile also lacked desired systems—such as data backups to identify and resolve infrastructure issues—that meant it took longer to fix outages than if these tools had been available. Furthermore, the team sought to provide robust security for user and corporate data to minimize the risk of theft or leakage. Kdan Mobile chose Amazon Web Services (AWS) because AWS services would enable the business to optimize its infrastructure and deliver new applications to meet client demand. Using AWS would enable Kdan Mobile customers to access its applications from any device at any time. AWS also provides infrastructure capable of scaling to support the company’s anticipated fivefold growth in customer numbers, and incorporates multiple layers of security to prevent unauthorized access to infrastructure, applications, or data. Finally, AWS operates its infrastructure in a range of global markets, supporting Kdan Mobile’s plans to enter new markets and minimizing latency that could disrupt the user experience. Kdan Mobile completed its initial migration to AWS in 2013, and now operates its AWS infrastructure in multiple Availability Zones in the US East (Northern Virginia) Region. During the last three years, Kdan Mobile developed its cloud environment using a range of core AWS services, including Amazon Elastic Compute Cloud (Amazon EC2) instances to provide server capacity and Elastic Load Balancing to distribute traffic. Amazon Virtual Private Cloud (Amazon VPC) is used to block external Internet access to create a safe environment for data processing, while Amazon CloudFront provides rapid access to Kdan Mobile applications for users distributed across a range of geographic locations. Amazon CloudWatch enables Kdan Mobile to monitor when server instances are overloaded and adjust server capacity to accommodate higher traffic generated as a result of marketing events. “As our knowledge of the technology grew, we decided to use the serverless infrastructure of AWS to support the development of a ‘push’ mobile phone system,” says Kenny Su, founder and chief executive officer at Kdan Mobile. In this serverless structure, AWS would take care of operating system maintenance, capacity provisioning and automatic scaling, as well as code and security-patch deployment for Kdan Mobile. 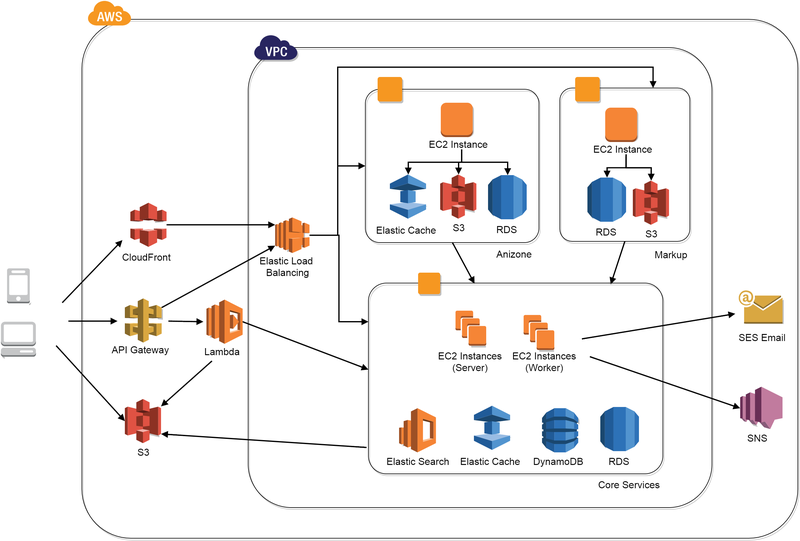 “We received feedback from AWS on our proposed architecture featuring these services and undertook some fine-tuning as a result. With AWS, our engineers can focus on developing new features to improve the product,” says Su. Kdan Mobile is now able to diagnose and resolve any infrastructure issues before they impact customers, minimizing potential disruption, while the multi-layered security of AWS provides robust protection against data loss, theft, and leakage. To learn more about how AWS can help with your mobile services, visit our Mobile Services details page.